Terrorvision were born in 1988 out of the remnants of a glam rock mess called Spoilt Brats, an amalgamation of art school buddies Mark Yates and Leigh Marklew, drumming loon Shutty and long-haired urchin Tony Wright. Incessant touring – including support slots with long-time heroes, The Ramones and Motorhead, backed up positive reviews of their debut album Formaldehyde. At the end of 1993 they decamped to New York City to record their second, breakthrough record How to make friends and influence people with alt-rock uber-producer, Gil Norton. The album went on to spawn five top-30 singles during 1994, catapulting the band into the mainstream. The boys reunited in 2005, then again in 2007 and every year since to play gigs, hang out and party! 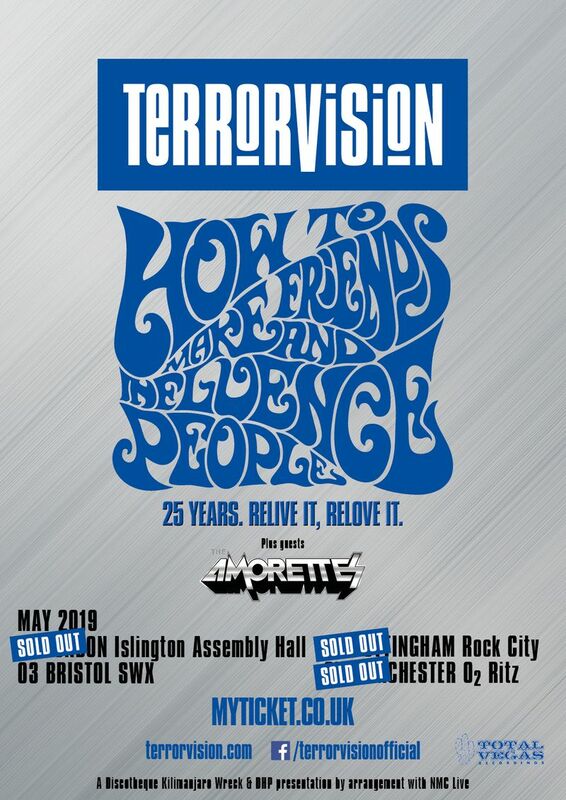 In 2009 they celebrated the 15th anniversary of their seminal How to make friends and influence people album with a sold out tour, playing the entire album in order and in its entirety! They'll tour the UK to play the album in its entirety again in May 2019!